After such a reflective season’s passing, and many days spent with family, I know I’ve thanked God numerous times for our many blessings of family, health and prosperity. I’ll admit, however, most of those prayers have been spoken hundreds, if not thousands of times. Repeated. Rehearsed. Routine. Those moments that throw me back into times of complete despair are when I utter my most heart-felt words to my precious Christ. I’m not proud of that-the fact that it takes such magnitude for my prayers to be real, raw and honest. I think my new year’s resolution will be to pray with the fervent heart of my most trying times. A suffocating memory crept into my chest. After her third open heart surgery, she had three tubes sutured into her chest which left their marks. Other than the tell-tale zipper down her chest, these are the most prominent scars on her tiny body, two quarter sized scars where the tubes once captured fluid that drained from her chest. The tubes were connected to collection chambers. These two “boxes” were beside her bed, followed us to the Atrium, were with her day and night for weeks. She has never spoken of them until tonight. There are two memories, specifically, that bring about insurmountable pain, probably two of my darkest hours. During these moments, I cried out with every ounce of my being. I prayed with all that I am. 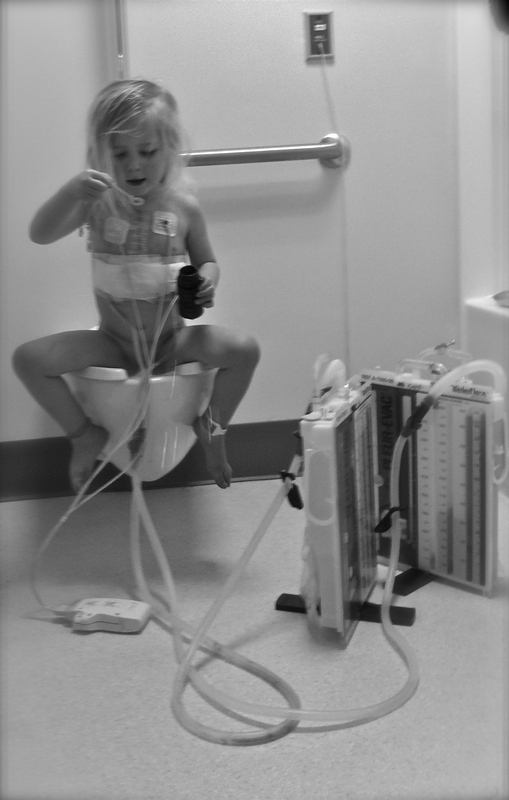 One of those memories was when Mary Clare’s drain tubes were being removed. Hearing her screams brought a feeling of complete and utter helplessness, fear and anger. I couldn’t take away the immense physical pain she endured. It was necessary. I begged God to give me the pain. I prayed that she would remember nothing of it. I prayed that she not hate me for allowing it to happen. And honestly, I prayed for God to forgive me for hating him at that moment. Another one of those memories was on the night of Mary Clare’s birth, June 27, 2007. Mel was on a work conference call away from the hospital. I walked from the maternity ward to PCIUC, where my sweet newborn was sleeping. A few hours passed. I relished in my time with her, breathing in her sweet breath, noticing every little wrinkle and admiring her tiny pink bow that Joy, her kind nurse, placed in her hair. Just before I kissed her goodnight and headed back to my room, I heard an alarm sound. Immediately, I was alone, crouched in the hallway outside of the PCICU doors. She coded and I had no idea if I would see my baby girl alive again. I was so angry, sad, and confused, but I prayed. I don’t even remember how long I was in the hallway. I know I wept and kept repeating, “Your Will be done. Your Will be done.” It was a time that I prayed for nothing and everything at once. I didn’t see her awake until after her surgery 5 days later. I was helpless, scared and angry. As life goes on and time heals, I find myself recalling those memories less and less. Memories that have changed me, that define me, that shake me up. I’m not sure how much Mary Clare will remember of her young life and honestly, I hope that as she grows she’ll not remember, only read about them here. But those are two moments of many that I can pinpoint relying entirely on God to breathe, to move, to make it one step further; moments that I poured my soul into his. Moments that I am thankful for. Thank you, God, for bringing me to my knees tonight and for reminding me to pray fervently without hesitation. Always. I was moved to tears, not for the first time, by your words telling of your walk with God through all of your frightening journeys. I cannot empathize with you because I haven’t had those circumstances in my life. However, I can join with you in praising God for his loving presence in the good and bad times of life. I think we all get complacent when things are going well, but it only takes something like a beautiful sunrise or sunset or a newborn baby to bring us back to our knees in prayer. You will never have even an idea of the number of people that your life has affected and caused them to turn to God and his precious Son, Jesus! the good and bad and the ho-hum times. So sweet! You need to write a book. People are so amazed when I tell them your story! I think that God gives us the worst of times to know what the best of times feel like. I love this. Thank you for the reminder, because like you, I definitely do my most honest, desperate, open-hearted praying when I’m brought to my knees because I can no longer hold myself up. Reading your memories brought be to tears, then the picture made me laugh out loud! That’s priceless! Kerri, I admire and love you and your family so much. You all bring me such strength. Yes, we do pray more through our trials and tribulations; however, I am learning to say more prayers of thankfulness each and every day. I look outside and see what God has given to all of us-the nature around us and know that He is always with us. He walks with us and His son, Jesus Christ, died for us. I have learned that God can heal us. Thank you so much for sharing this with us. I have been on my knees more times since becoming a mother than ever…I know God had truly blessed me through the years, but it seems I leaned on Him more as I became an adult. Mary Clare may remember some of the pain she endured, but she will also remember the love and care you, Mel and McCanless gave her. Your precious family has shown courage and faith through all of the pain you shared-we have all learn “All things are possible through Jesus Christ our Lord”. I think I repeated that verse over and over everyday from my awakening until I fell asleep at night. I have never felt so close to God! We have all become better because of you and our sweet Mary Clare. I appreciate everyday and I thank God for my precious family!